Those familiar with both Heroes of Might and Magic 2 (HoMM 2) and Heroes of Might and Magic 3 (HoMM 3) are aware of many changes made between the two installments. A lot of the advances concerned gameplay, certainly for the better. 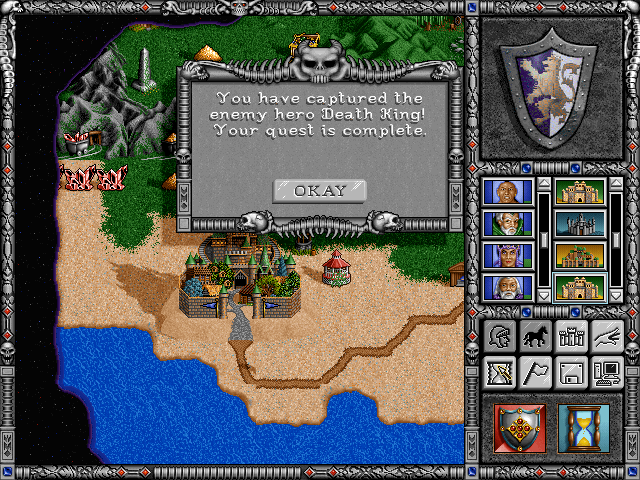 It was HoMM 3 that became the canonical one in the series. However, I’d like to argue that the adjustments actually went a lot deeper and touch serious anthropological points. The death of sacrum. Childhood’s end. The reality of myth replaced by the reality of politics and money. The most obvious shift is in graphics, moving from the bright and fairy-tale tone of HoMM 2 to a more serious and realistic timbre of HoMM 3. Along with a darker and more realistic palette came more serious changes. In HoMM 2, the castles were strikingly imbalanced, with the Knight being the weakest, almost laughably so with his peasants and swordsmen, and the Warlock the strongest, with the Wizard hot on his heels. As in a fable, no one would expect the earthy knight to stand a chance against the supernatural. The forces of Might (Knight and Barbarian) pose little challenge to the forces of Magic (Sorceress, Warlock, Wizard and Necromancer), and the inhabitants of this universe accept this fact. However tragic and unfair, such is the reality of myth. HoMM 3 made everything egalitarian. All castles are roughly of the same power, maybe with Fortress being an underdog. But the cosmic imbalance, with its terror and unspoken promises, is gone. Whether a barbarian or a wizard, the world offers you equal opportunities and success depends only on your effort, not on destiny. Also, notably, in HoMM 3 all creatures are upgradable, while in HoMM 2 this privilege was given only to select few (e.g. Warlock had only two upgradeable creatures, minotaurs and dragons). Now, what does this tell you? 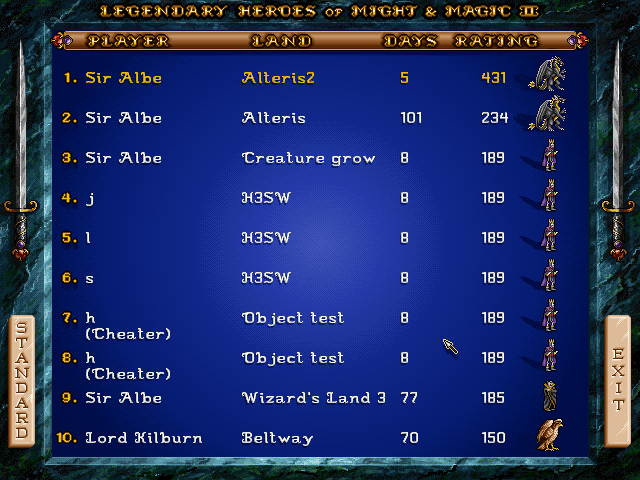 In HoMM 2, the castles were named after the hero’s class – Knight, Sorceress etc. In HoMM 3, the castles are castle types: Stronghold, Dungeon, Rampart etc. The hero – the individual, the protagonist of myth, the focal point of archetypes – is no longer in the spotlight. His role is replaced by an abstract system – the city, with its social structures and faceless administrators. The charismatic Big Man of hunter-gatherers, the Homeric hero is needed no more. His role is reduced to that of a mercenary hired by whomever runs the castle’s affairs. In fact, each castle now hosts two types of heroes, one devoted to Might and the other to Magic (Knight and Cleric, Ranger and Druid etc.). In this egalitarian setting, different heroes are most likely expected to compete with one another for the statesmen’s favors. Also, note how the economic and social functions were redistributed among different buildings. 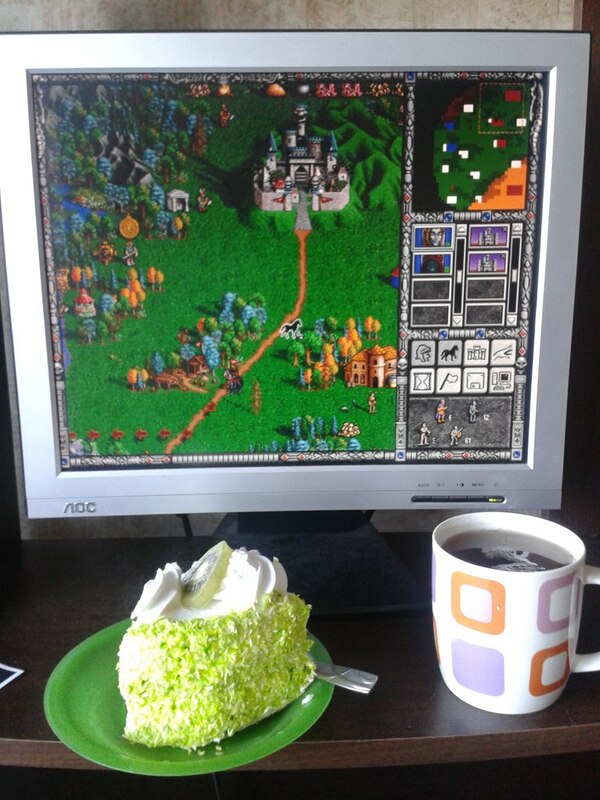 In HoMM 2, the castle was the sole axis of power, used for recruting troops, buying new buildings and hiring heroes. 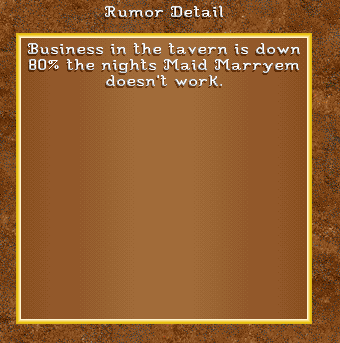 In HoMM 3, there is a division of labor. Castle is used only for recruiting creatures, new buildings are built at the town hall and heroes are hired in the tavern. It’s the town hall that’s visited most often by the player, not the castle. Military supremacy and a divine mandate for ruling, as exemplified by the central role of the castle, give way to the mercantile and political ways of the city hall. A telling case study is what happened to the Warlock. Most of his old creatures were transferred to other castles – griffins domesticated by the Castle, gargoyles loaned to the Tower, centaurs stolen by the Rampart and hydras taken away to the Fortress. His new castle is now the Dungeon, home not to fantastic beasts, but to sneaky subterranean monsters. Where as HoMM 2 Warlock swayed the creatures by sorcery and personal mystique, the new Dungeon overlord is a corrupt administrator of the underground. He gathers his troops by force, coercing the troglodyte lords to send him recruits, and by cunning, greasing the palms of minotaur kings and elite manticore trainers. 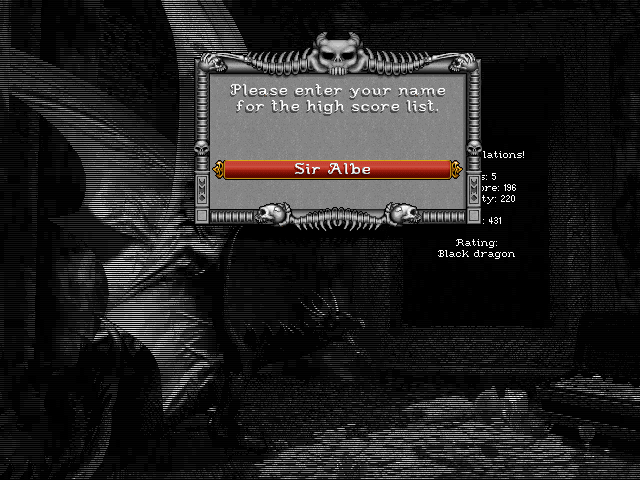 The black dragons, the most powerful creatures in HoMM 2, have been demoted to simply “another 7th level creatures”, powerful, but on a par with angels, titans or gold dragons of the Rampart. A small but characteristic difference is the building that gives any passing hero 1000 experience points. In HoMM 2, the building was a gazebo inhabited by an old knight sharing his wisdom. Presumably it was just life experience gathered from his many adventures. Or maybe the old knight had heard it all in some other gazebo, whose inhabitant also had visited yet another gazebo, and so on? Stories within stories. The veracity of this “gazebo knowledge” could be dubious, especially if passed through so many intermediaries; the old knight could be rambling like a senile uncle. But the oral tradition continued, however flawed. HoMM 3 had no gazebo. Instead, there were impersonal “learning stones”, which simply impart 1000 xp to the hero. No need to reflect on that. Just continue to the next learning stone, all identical. The list could go on. Perhaps nothing illustrates the abandonment of the mythical more strikingly than what happened to the Sphinx. 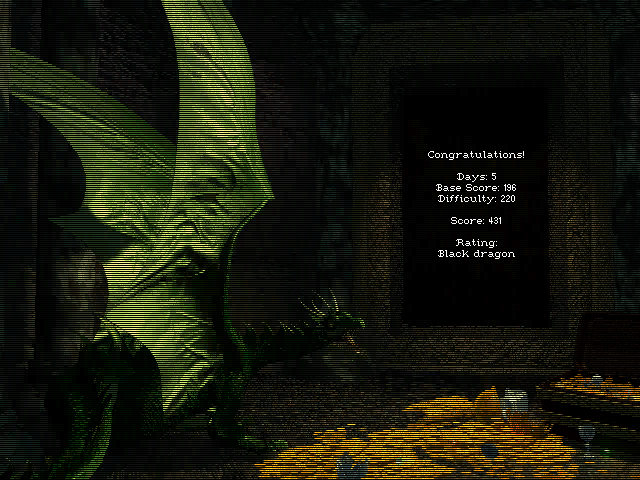 In HoMM 2 the legendary creature would ask the visiting hero a riddle, rewarding a correct answer with gold or artifacts and swallowing the unfortunate adventurer otherwise. There is no trace of the Sphinx in HoMM 3, lost is the sense of whimsy and mystery. In this world, where war is waged with war machines (ballista, first aid tent, anyone? ), there is no place for Alice in Wonderland-style riddles. To use Max Weber’s expression, this is indeed die Entzauberung der Welt. If you wanted to check out the gazebo… It has been dismantled. After the old knight’s death, the local ruler decided he needed some more wood for his personal chapel and ordered that the gazebo be taken apart. Uhm, thank you very much for this article! This is the great point of view that I didn't know and it's changing a little my perspective. I've never thought about cursed artifacts from perspective of the game and the world where it takes place. A nice read indeed. Of cousre I agree with most. Interestingly H5 has "reversed" some of the issues while screwing others even more. Return of single heroes per castle and more integrated class skills on one hand and on the other hand Ashan mythos. WTF is a "tree of Sylanna" for a non-Ashan custom map? The inequality of is certainly a problem for competitive play and from this sense it is understandable why they tried to make everyone equal or a "socialistic revolution". Anyone remembers the Warlords (Warlords 2 deluxe in particular) game? A game with no tactical battles and minimal town building? It was about expanding by capturing towns and the maps had plenty of them. I have always thought that it would have been nice to keep the town development and battles not more complex than in H2, but go more to Warlors2 direction - more castles and villages per kingdom plus more sophisticate diplomacy and scouting. Even if the towns themselves are not equal one is going to have several of them even before encountering enemies. Ones strength is not really determined by the starting town, but the ways of expansion and choices what and on which location to build. We could say - it does not take all citizens to be equal for two emipres to have equal strength. WTF is a "tree of Sylanna" for a non-Ashan custom map? Well, to be honest this point doesn't make much impact in my opinion. A nice example would be StarCraft, where you had Citadel of Adun and other structures for custom scenarios which didn't feature classic Protoss lore. Yet, you were able to change the building names. I must admit, however, that Ashan lore isn't tempting at any curcumstances. It's too plain and simple with an illusion of being complex, and its key characters are not sympathetic. I prefer classic MM concept with the Ancients and sci-fi background, even with its secondary moments like a major inspiration from Star Trek, a selection of retcons and lack of clarity on countless questions not because of mystery, but because NWC didn't care much. The list could go on. Perhaps nothing illustrates the abandonment of the mythical more strikingly than what happened to the Sphinx. In HoMM 2 the legendary creature would ask the visiting hero a riddle, rewarding a correct answer with gold or artifacts and swallowing the unfortunate adventurer otherwise. There is no trace of the Sphinx in HoMM 3, lost is the sense of whimsy and mystery. Well, the reason for the Sphinx and Daemon Cave is clear - both of these objects are unstable in terms of gameplay. 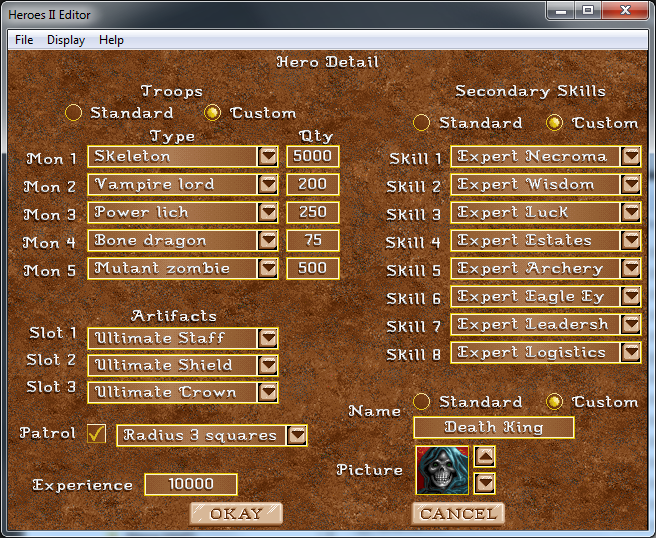 Heroes 3 is in fact a more pragmatic game. The cursed artifacts, however, are fun. They just didn't fit to the new inventory system presented in H3. Only H3 modding will show if the exclusion of such artifacts was really necessary. For a long time, I've known the tactic of keeping a Fizbin of Misfortune on a secondary hero, and suiciding him against an enemy to give it to that hero, right before I attacked with my main hero. I finally got to use it once in a multiplayer game. Wish I could have seen the look on his face. Made a huge difference in the battle, and is part of what won me the game. It is actually counted for the computer player too. If I recall correctly, a priority for attacking is lowered when a target carries any of the cursed artifacts. I've to make up for the gaps in knowledge on studies , thus I will get back to work on mod after Christmas. Good luck, and come back soon! "Gazebo Knowledge" Man, it should be a new mem across the HoMM community! 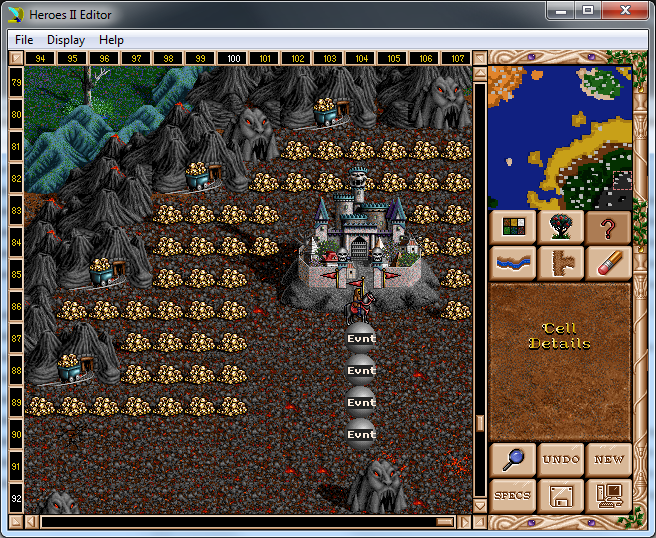 As for the subject, I never liked HoMM3 much. Yes, I had played it a decent amount of hours/days/months back in my twenties. But the lack of THAT fairy-tale atmosphere, and of THAT fairy-tale visual style, and of THAT fairy-tale music... oh, how I missed it all in HoMM3! Looks like you've met that 1% of cases where the autocalculated combat in AI vs. AI fights gets an error. The reason for this is that the probability range for winning the combat was coded incorrectly by NWC programmers, being 101% at maximum instead of pure 100% (the programmer probably missed his 9th grade in school and forgot that integer ranges like [0;100] contain 101 numbers because zero also counts ). That case was a major problem in Heroes 2 offline tournament practice, because technically it's not cheating. There is also a probability of both combatants being eliminated from the adventure map simultaneously because of this error. Strange, did you have a save before he dies, to "cheat" what he does? He has a big army and a radius of 3. Hahaha, I didn't know about the case of this happening, but I only experienced it happening this one time Very interesting. Like I said above, it all was about autocalculated fights. Some of the artifacts around the Death King may have been guarded by rogues or level 4 monsters. And yes, the bug is not very reproduceable. Weird, there is nothing to fight in the 3 squares radius. He received the Dimesion Door spell in the Mage Guild. He teleported himself near a Daemon Cave. He chose to fight the powerful and grotesque Demon, not the servants, and he lost. He did not want to pay 2500 Gold to get back his life. I have been struggling with the H3 maps "Sands of Blood" recently. I cannot beat it on impossible and I keep loosing. Have anyone played that map before and can give me some advise? You should also restart game for a couple of times to make you sure, that subterranean guards won't be a big trouble for your hero. I have tried with necropolis with Galthran (skeleton spec. ), but I got overrun by the computers from both sides. I also tried with conflux (I choose Grindan for the daily +350 gold), but I lacked special resources and only slowly got elementals. The computers reached the underground before me around week 2 and then they were too strong to deal with if I had no castle to defend. I will try out your tips and hopefully return triumphant! I managed to win the map! I picked Rampart and chose Jenova (+350 gold) and was so lucky to be able to recruit Dungeon hero Damacon (also +350 gold/turn) in the first week. I instantly rushed the gold mine and then sawmill. I had Green Dungeon to the south, Blue Inferno to the west and Tan Fortress to the north. Green cleared off the subterranean gate guards around week 4 and I decided to move in on his area with my main Mephala(Jenova and Damacon should just stay home bringing them ) Green stayed and guarded his quite well defended castle. A couple days later I was lucky enough to be able to reach his castle without him defending it and I easily got the Dungeon town. As I did that Tan moved down from above to attack my Rampart town. I managed to defend it with some dwarves and dendroids. Then Green's main arrived at the Dungeon town and he beat me of from it in a very close fight. Luckily I had a secondary hero that was strong enough to reclaim it the day after. Then Green threw all his heroes at me to try to regain a castle, but even his other main couldn't take it back. Meanwhile I sent Mephala to the western Inferno town and found it quite empty as Blue was out. Then the last Green hero attacked my Rampart town and lost. Green was out! Then Blue attacked first my Rampart and then my Inferno towns, but also he was not successful and was thrown out of the game! I sent Mephala to the northern Fortress castle, but it was heavily defended by Broghild. Then he did something really stupid. As I was running around near his castle flagging mine and stuff he suddenly left the town and ran the opposite direction of me. He only left a couple gnolls to defend. I of course took his castle and he immediately returned to take it back. That was the best fight in the game and I believe I wouldn't have made it if it wasn't for the 2-hexed fortress moat Then only some weak secondary heroes of Tan was left and I won the map!